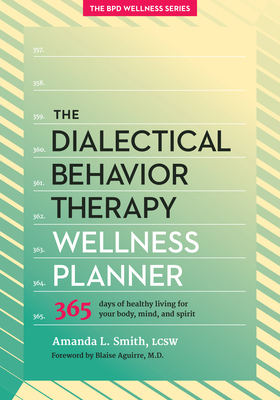 The Dialectical Behavior Therapy Wellness Planner is a practical tool for the emotionally sensitive person looking for an easier way to track emotions and behavior as well as monitor progress over time. This book is a helpful tool for anyone who struggles with emotional sensitivity and/or Borderline Personality Disorder to use as you work toward creating a healthier, more meaningful life--a life worth living--by balancing acceptance and change. Use the Planner to consistently track and report on your journey to healing. It's a journal that helps you keep everything in one place, and keeps you focused on where you are and where you want to go. Start on any date with the monthly, weekly, and daily calendars designed to help you plan for success as you practice skills and make a commitment to daily self-care. You can use it to: track your emotions and behavior monitor your progress bring structure into your day Please note: the planner is not meant as an in-depth education or training on Dialectical Behavior Therapy nor is it meant as a replacement for diary cards or other useful resources in your journey to healing. Instead, it is a supplementary tool for tracking your personal progress. Amanda L. Smith is the author of The Borderline Personality Disorder Wellness Planner for Families, the second book in The BPD Wellness Series. Therapist, Amanda L. Smith, LMSW, is founder of Hope for BPD where she provides treatment consultation for Borderline Personality Disorder (BPD) and case management for clients around the world. She also publishes My Dialectical Life--a daily email dedicated to Dialectical Behavior Therapy (DBT) skills. Her career in mental health began when she served as the executive director of the Pinellas County, Florida affiliate of the National Alliance for Mental Illness (NAMI). In 2007, she founded Florida Borderline Personality Disorder Association--a 501(c)(3) organization dedicated to providing advocacy, education, and support for persons diagnosed with BPD and their families. Amanda received her MSW at Baylor University and is currently working as a DBT therapist.